What would be your expectations when you’re all set to watch a movie from the maker of mass commercial movies ‘Sandakozhi’, ‘Bheema’ and ‘Paiyaa’? Yet another movie of its genre isn’t? Doubtlessly, ‘Vettai’ becomes a superb entertainer for all with its rich ingredients of commercial elements – fun, action, romance, glamour, sentiments, etc, etc… The basic plot of the film might be little hackneyed, for we get to know it right before the opening titles. It’s so simple and can be read in just few lines. It’s a story about two brothers Thirumoorthy (Madhavan), fearful and timid while his younger brother Gurumoorthy (Aarya) is completely opposite. It has been Guru’s birth nature that he cannot bear anyone hurting his brother and if it happens, next month they’re done to the dusts of grounds. While their father, a sincere police officer unable to bear the shock over his transfer order breathes his last in sleep, Thirumoorthy is forced by Guru to take up the same job. Though he is nowhere away from timorousness, he wears the uniform, but is appalled over the notorious gangsters – Annachi (Ashuthosh Raana) and Maari, who have been through their enmity for years. Gurumoorthy comes into the unknown picture of knocking down the baddies, completing the mission that was assigned to Thiru and he earns praise and respect in department. But when the roughnecks at poles apart find out that Thiru isn’t what he seems to be, they smash him black and blue almost killing him. Would Thiru able to settle scores or has to again seek the favor of his brother? Watch it over screens that are entertaining in many parts. The writing is perfect and it’s the first and foremost reason why Vettai stands out as the best treat for the audiences. The screenplay is very much engaging from beginning till end as it leaves nowhere the audiences’ attention scattered. The characterizations are delineated perfectly and the romantic portions between the lead pairs – Madhavan, Sameera Reddy, Aarya-Amala Paul is done decorously. The humor quotients are yet another asset that keeps the film on high tempos. The mass appeal of the protagonists – Madhavan and Aarya is extraordinary that it easily wins the applause of audiences. Lingusamy walks into the unexplored territories of Aarya as a mass hero and it works out on its best. Madhavan could have shed down some weight to look perfect and handsome. Bu his performance level is colossal as he emotes exactly to the situations as a coward person and a thrashing cop. Sameera Reddy needs a better makeover and her costumes in saris could have been better. Amala Paul makes an attempt to appear glamorously and woo down the audiences. Yes, it works out to certain extent. Ashuthosh Raana as baddie rocks in his style of performance and action sequences. Yuvan Shankar Raja disappoints us with his songs as none of them, except ‘Pappa Pappapam’ are good. Nirav Shah’s cinematography captures the beautiful locales of Pondicherry and his ability to show the area as Tuticorin is a good job. Final Word – Vettai is sure-footed winner for this season and will have repeat audiences in theatres for Lingusamy’s narrative style, power packed performances of actors, Brinda Sarathy’s dialogues, chemistry between the lead pairs and action sequences…. Lingusamy is one director who has the commercial formula down pat. And his latest, UTV's Vettai, is certainly among the most appealing mainstream fare he has produced so far. The story is simple. Two brothers, Thirumurthy (played by R Madhavan and Guru (played by Arya) are thick as thieves. Only, Thirumurthy is pretty much a wimp and needs his younger brother to fight all his battles, from quarrelling during a kite-flying expedition during childhood right up to adulthood. Guru cajoles his brother into accepting a police post after their father's death and Thirumurthy, after much pleading, accepts the post along with the transfer originally assigned to his father. And this is where the problem starts. Thirumurthy, who quakes with fear even if someone sneezes, find himself caught in the toils of the local bigwig (introducing Ashutosh Rana who, of course, controls the area with his violent ways. Thirumurthy gets tangled up right away, and from then on, the story is a classic mixture of comedy and action, clearly taking plenty of leaves out of the K Bhagyaraj movie, Avasara Police 100. Wimpy cop and courageous brother both run riot, leaving you in fits of laughter and touching you with great sibling sentiment. In the midst of all this are firebrand Vasanthi (Sameera Reddy) and her sister Jayanthi (Amala Paul), who have no great role to play except pretty up the proceedings. The first half, peppered with dialogues and humour, moves at a fantastic speed, making you wait on tenterhooks for the rest. The second half has its moments but is considerably slower. Mindless masala takes over soon, leading to the completely predictable bash-fest. Madhavan and Arya have a ball playing brothers. The two are perfectly in sync, playing off against each other. You have to give Madhavan credit for taking up the role of a wimpy policeman who shakes in his shoes, even as he lets Arya play the hero, walking, talking and even fighting in style. The two hit it off perfectly; the only reason you can stomach some silliness in the screenplay is because of their comic timing. Sameera Reddy is dashing, as always. Unfortunately, just when you think she is going to have something to do, her role dwindles into nothing. Amala Paul struts, pouts and hams to the hilt. Her role is shorter; so are her outfits. Ashutosh Rana looks far more dignified than a rowdy should, and is as clueless as they come, letting both himself and his henchmen get beaten up. Brinda Sarathy's dialogues strike the mark when it comes to comedy and make you squirm a bit when it comes to verbal punches. Nirav Shah's camera work has little to do in an action entertainer like this. The look of the film is clean, neat, and focuses completely on the actors. Anthony's editing works, except for the last half hour, which could have done with some trimming. Yuvan Shankar Raja's songs, sadly, do not hit the bull's-eye here, despite his past track record with the director. Lingusamy's strength lies in packaging actors who play to their strengths, and mixing comedy and action into commercial fare. Logic obviously goes for a toss many times, but there is plenty of entertainment. This diary of a wimpy policeman may not be a classic, but is fun nevertheless. After 'Run' almost ten years ago, director Lingusamy and Madhavan come together in a bid to repeat the magic, this time with added strength. They have young and bubbly Arya to their company. A sibling story, 'Vettai' promises plenty of action and emotion. Lingusamy has ensured that his typical commercial elements find a place in 'Vettai' that proceeds in quick pace with enough twists and turns. Firstly, the story is as old as the hill. Something we have seen since MGR days. But Lingusamy has given a fresh coat to it. There are host of characters and events unfold without a pause. Gurumurthy (Madhavan) and Thirumurthy (Arya) are brothers who are contrast to each other. The former is shy and timid while the latter is bold and takes things by its horns. Their father is a police officer. After his demise, a reluctant Guru is forced to take up the job. Thiru assures him all help. He even goes to the extent of working undercover and helps his brother emerge successful in fighting goons. There is Vasanthi (Sameera), a talkative village belly who marries Guru. Her sister Jayanthi (Amala Paul) falls for Thiru and his mannerisms. Meanwhile there is one Annachi (Asutosh Rana), an embodiment of evil in the town. He takes cudgels against Guru. Now Thiru steps in to set things right. At one point, coward Guru is prepared to face all challenges. How the two brothers join hands to eliminate Annachi forms the rest. Madhavan is at his best playing a timid youth. He seems to share a good rapport working with Lingusamy and it is evident on screen. Arya is appealing. His vibrant energy adds strength to his character. At places, his character seems to resemble the one that he did in 'Boss Engira Baskaran'. Amala Paul and Sameera Reddy share equal screen space. Three cheers to Nirav Shah. The man behind the lens has done a commendable job. He has captured the village with all its beauty. The soft lens speaks poetry. Equally impressive are the stunt sequences captured by his camera. Yuvan Shankar Raja's songs are just adequate. Produced by Thirupathi Brothers and released by UTV Motion Pictures, 'Vettai' is a cliched path traveled by Lingusamy. But the right packaging of commercial elements with apt star cast makes it count. If you are ready to forget all logic and want to enjoy a masala movie this festive season, head on to 'Vettai'. Director Lingusamy who is known for delivering wholesome commercial entertainers treads again in his comfort zone presenting this year’s Pongal offering Vettai with his Run hero Madhavan along with Arya, Sameera Reddy and Amala Paul. Thambi Udayaan Padaikku Anjaan is the adage around which Lingusamy spins his tale with the quintessential elements of a mainstream commercial fare viz. sentiment, romance, humor, action and music. Lingusamy delectably mounts his first half that is replete with enjoyable screenplay. Brinda Sarathy comes to his aid with witty dialogues embellishing the fare. The comic timing of the lead stars is also good enough to bring out this effect. The Adonis Arya with his impish grin steals the show with his charming antics and the sequences when he is trying to drive away the foreign Maappillai or help out his meek brother or tease Amala with his ‘thanks’ are simply enjoyable. For Maddy, his innocent face aids the characterization of Thirumoorthy very well. His expressions on being appreciated for his ‘brave act’ by Nasser and later on a proud look on being approached by Sameera for Amala’s wedding with Arya are just a few examples. Amala Paul looks fresh and appears to have enjoyed playing her role. Sameera impresses as the talkative bold elder sister. The scene when Sameera cajoles Arya to marry her sister when the rest of them appear not so interested and the one when Amala realizes why she was being thanked by Arya when he came to her house are delightful. Mankatha Ajith scene sends the audience into frenzy and the apt shot of Jiiva supposedly looking at Arya in action is also well done. Nasser’s cameo is enjoyable. Even if Thambi Ramiah mouths a serious dialogue, it brings the roof down and the actor makes his presence felt. Villain Ashutosh Rana does what all the villains in a commercial fare do and his costumes too are chic, thanks to costumer Seenu and Deepali Noor. The villains caricatured with loud voices, stale punch dialogs, long hair and unkempt beard looks outdated. Technically, Vettai has Nirav Shah’s strong backing in the camera department and the talented lensman has not let down Lingusamy. His visuals bring out the mood perfectly and the lighting during the railway track scene when Arya rescues Maddy is a small example. Yuvan’s scores are just about average and the BGM leaves a lot to be desired. Fight choreographer has chartered some interesting action moves pumping adrenalin. The major positive factor for Vettai is its light hearted humor which is something fresh and enjoyable sans double entendres. As long as the film travels on this route, it is enjoyable but when it attempts seriousness, that’s when it falters evoking unintentional humor jeering the intended effect, the best example is when Maddy tries to get up from his wheel chair. In the second half, when the film attempts to shift to a serious gear with clichéd punch dialogues, lengthy action sequences, the fare becomes predictable and the engaging factor starts going south and restlessness settles in. 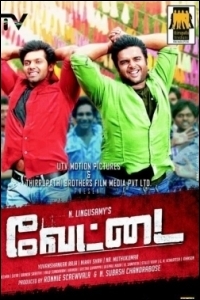 Summing up, Vettai is a commercial fare that works in the humor, action and romance department but not when it is attempting a serious tone. The New york Times reviews Vettai!! !